Basie and Carien Vosloo invite you to experience some of the best fly fishing for trout that South Africa has to offer on their three farms, Gateshead, Birkhall and Branksome, all situated in the North Eastern Cape Drakensberg between Barkly East and Rhodes and in beautiful surroundings which range from the montane to the pastoral. They provide an ideal refuge from the hustle and bustle of city life in an area renowned for its scenic landscapes, its clean air and clear water, its bird life and San rock art and its beguiling hiking and biking routes, horse rides, warm fireplaces and equally warm hospitality. Gateshead is a 2 000 hectare farm situated near the source of the Bokspruit stream. Aside from the horses, cattle and sheep that are pastured there, the only sign of human habitation is a small cottage, built at the turn of the last century and set in a grove of equally old fruit trees beneath the towering Gateshead peak. It sleeps six adults, is well stocked and serviced and has a north facing veranda that is the perfect place to tie flies in the early morning sun. 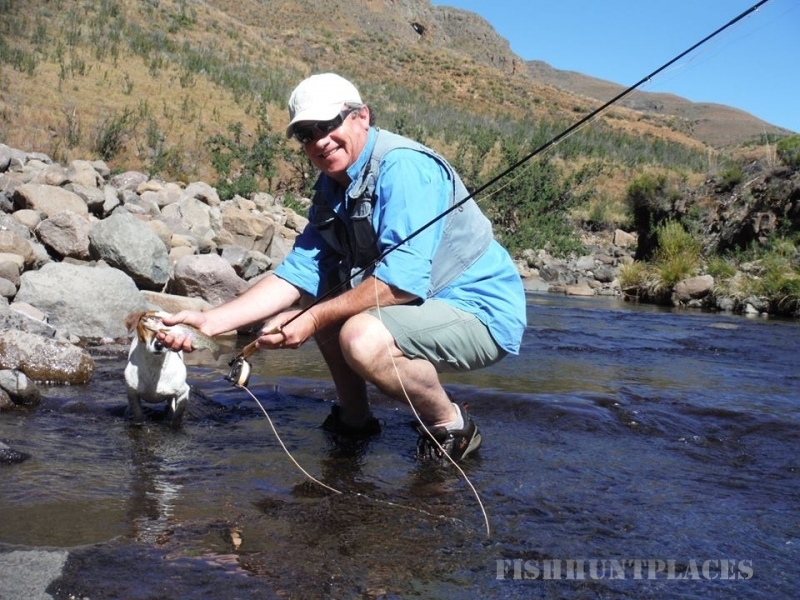 It overlooks the Bokspruit which provides 14 km of pristine fishing where the upper reaches rarely see an angler. The stream at the top of the mountain provides even more challenging angling than the valley around the cottage which is more pastoral. It would take a day’s hard angling to fish from the cottages to the escarpment but horses can be provided for those who would like to fish the upper and seldom-accessed stretches of this stream. The water is clear and shallow enough for easy wading. Few trees shelter the banks, and the trout are ever alert and adept at using light and shadow and the kaleidoscope of the brightly pebbled streambed to remain unseen and to vanish in an instant if danger threatens. 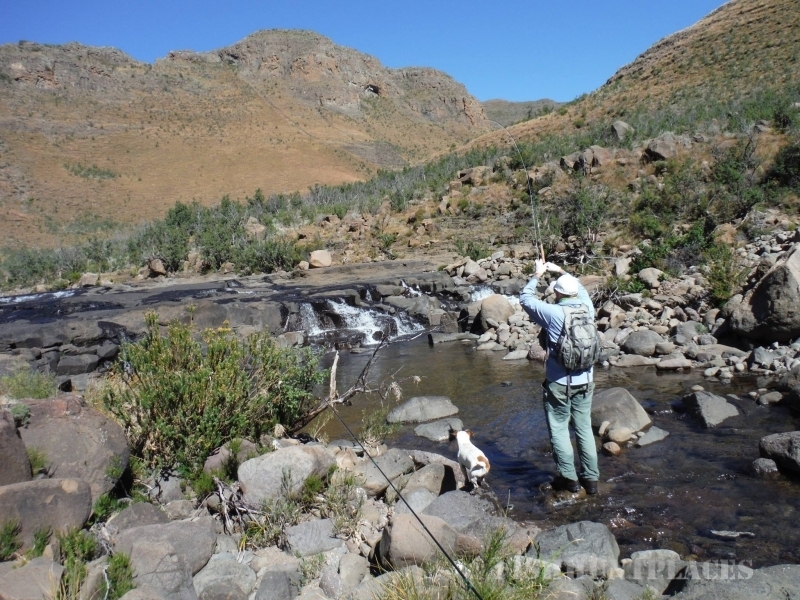 In contrast to the steep gradient of the Bokspruit and its small, rocky pools, the Sterkspruit which runs past the Vosloos’ other farms, Birkhall and Branksome, is bigger and slower and its fish are, on average, larger. 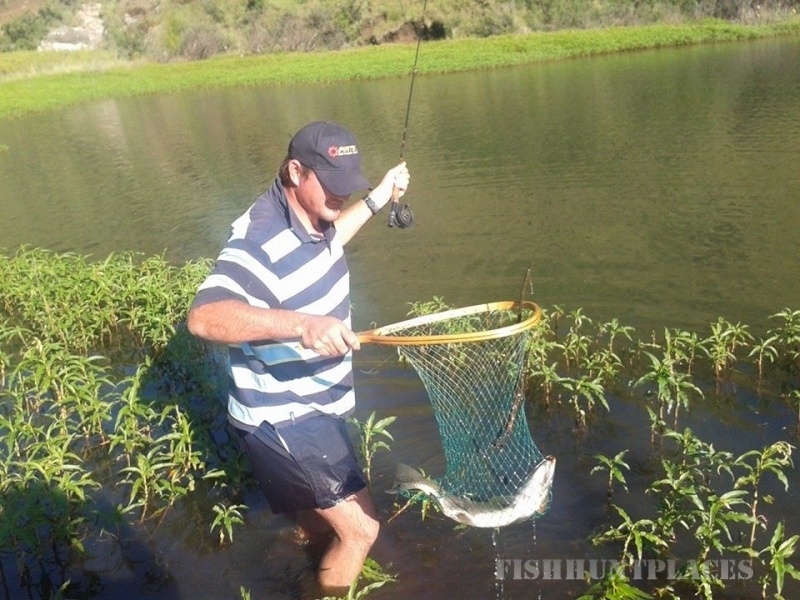 In all, the two farms have about ten km of river frontage which is more than sufficient for a day of fishing. 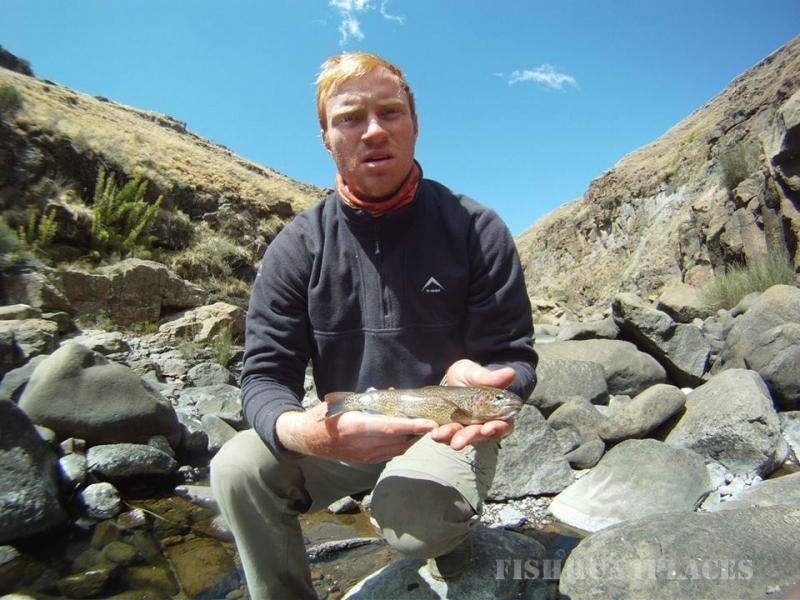 The best angling months are October and November and then from April through to the end of May. 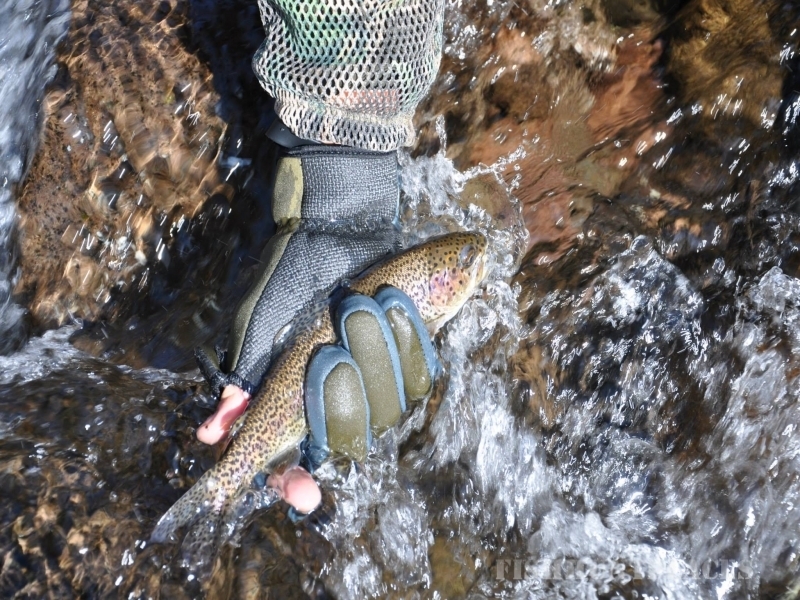 Small dry flies and nymphs work well and this is quintessential upstream, floating line, fast water fly fishing. The accommodation at Birkhall is a single bedroom cottage which looks over the river and a dam which harbours trout of two kilograms and provides some of the best stillwater angling in the district. Read more on Birkhall here. Branksome is a typical Eastern Cape farmhouse, spacious, cool and comfortable. All are fully provided with bedding and cutlery and guests need bring only their personal effects and fishing tackle. If arrangements are made in advance, catering can be provided.